This topic of this week’s Smile Game Builder tutorial is Advanced Cooking. 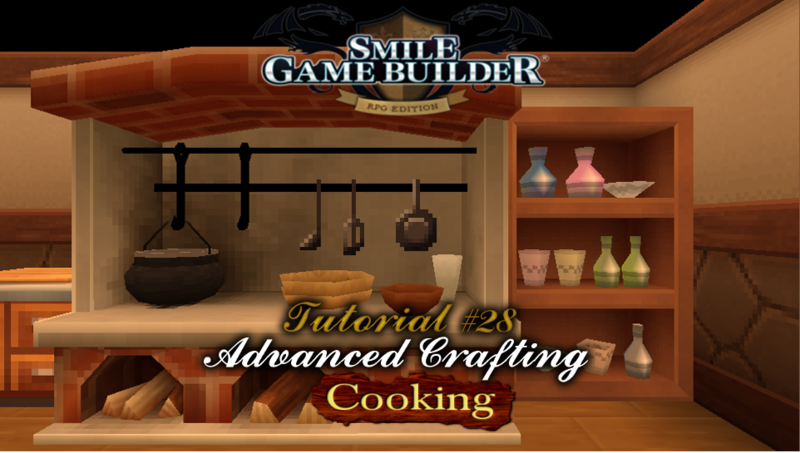 In Tutorial #28: Advanced Crafting (Cooking), I revisit the previous Cooking tutorial (#19) and add a Cooking Level and Cooking XP. This is particularly inspired by Runescape, a game I used to play passionately but have since moved on from. You can view my other Smile Game Builder tutorials on the SGB Tutorials: Complete List page. This system is flexible for use in other crafting areas, but is also adaptable for other similar systems as well. Over time, I’ll continue with the Crafting System, adding new techniques and areas, such as farming, gathering or advanced mining. That is, unless inspiration dictates otherwise. At the moment, next week’s will either be mining or fishing. However, as always, this is subject to change, depending on inspiration or how-to requests.